The table compares the number of hours (x) to rent a bicycle to the total cost in dollars (y). 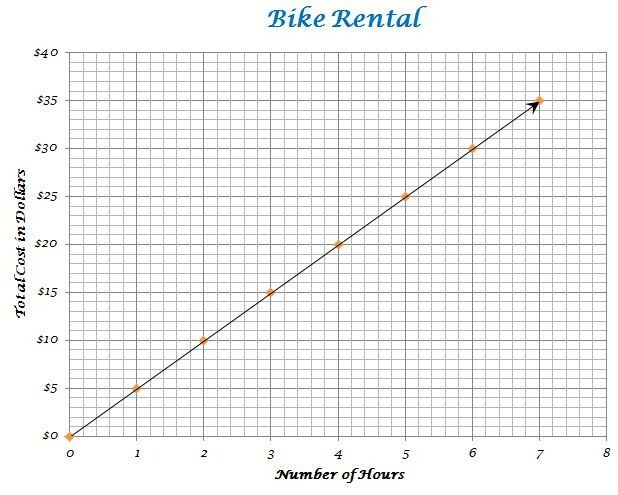 This graph shows the hourly rate of renting a bicycle. This graph is a straight line that begins at (0, 0). It cost $5 for each hour that you rent the bicycle. 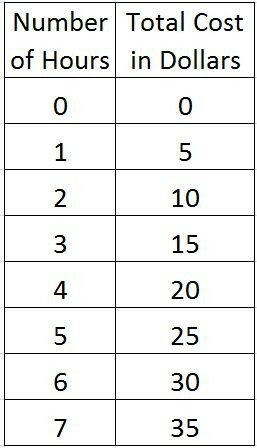 This problem is an example of a proportional problem because all ratios in the table are equivalent, and reduce to 1/5. The definition of a proportion is a statement that two ratios are equal. The table also has a constant rate of change and when it was graphed it created a line graph that started in the origin.